Back in 2013, the American College of Emergency Physicians—as part of the Choosing Wisely campaign—set a goal of reducing unnecessary head CTs for patients with minor head trauma, motivated in part by a growing body of evidence demonstrating an association between radiation exposure and subsequent cancers. ACEP referred to the existence of several clinical decision rules designed to help providers identify which patients could be safely discharged from the ED without a head CT. Despite this, multiple surveys of emergency physicians identified physicians’ fear of being sued for missing a head injury as one of the reasons that they ordered head CTs even when not indicated by one of these clinical decision rules. The idea that physicians would be at risk for liability even when following the most up-to-date evidence caused our group to ask, “Is this fear well-founded?” We sought to determine if there was any evidence to suggest that physicians had been found negligent for practicing in line with clinical decision rules. Unfortunately, legal research is hampered by imperfect data. There are databases with selected legal cases but no database containing every single legal case, so qualitative information is much easier to come by than quantitative data. We used a database called WestlawNext, which contains tens of thousands of legal cases selected by courts to be published, and searched it for all cases involving patients with head trauma evaluated in an emergency department with the aim of describing these cases. Through this database, we came up with 60 total cases, involving 52 adults and 8 children, in which emergency providers were sued for not ordering a head CT in cases of head trauma. Using the information available in the legal reports, we applied 5 different clinical decision rules to these cases to see—if a clinical decision rule would have been applied—if the rule would have indicated the need for head CT.
Of the 60 cases identified, every applicable clinical decision rule would have indicated the need for head CT in 43 cases. Of the 48 cases with a known outcome, providers were found negligent in only 10 of these cases, settled in 11 cases, and were found not liable in 27 cases. 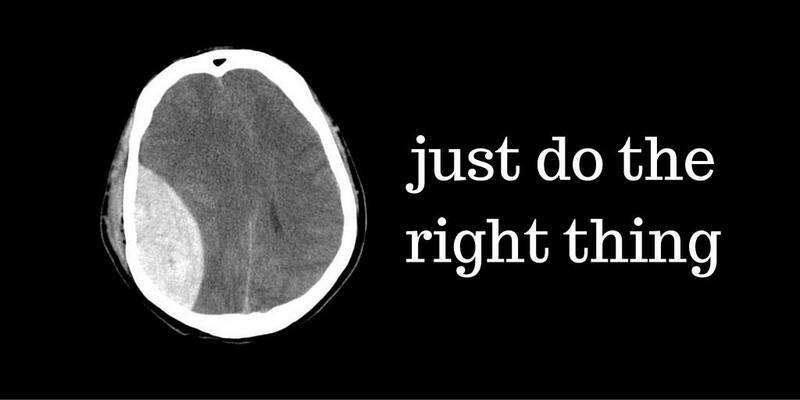 In all 10 cases in which providers were found negligent and in 10 of 11 cases in which providers settled, the need for a head CT would have been indicated by every single applicable clinical decision rule if it had been used. Similarly, in the 8 cases involving children, the applicable clinical decision rules would have indicated the need for head CT or prolonged observation in every single case. Overall, this study provided little support for providers’ fears that they will face liability for not ordering head CTs when they are not indicated by clinical decision rules. The only cases we identified in which providers were found liable were cases in which every single applicable clinical decision rule would have indicated the need for head CT. These data suggest that, rather than increasing providers’ risk of liability, use of clinical decision rules may have the potential to decrease the risk of liability for providers managing patients with head trauma. From Goel and Gaillard via Radiopedia. http://radiopaedia.org/articles/extradural-haemorrhage.